Got Milk? Got synthetic growth hormones in it? …The FDA Label That Tells You Nothing….OR How misleading… Don’t these people realize they are messing with my hormones ?? Is the milk (cheese, yoghurt, etc.) that comes from cows pumped up with synthetic growth hormones, the same as the milk that comes from cows that are not raised with synthetic growth hormones? We also know from environmental medicine that synthetic hormones disturb the delicate hormone balance within each of us to ill effect. In her brilliant book, The Molecules of Emotion, Candace Pert, Ph.D., (neuroscientist/researcher; discoverer of the opiate receptor in the brain) says, “only recently have we gotten the hard proof that the accumulation of these toxins in our bodies chronically stimulates our estrogen and testosterone receptors, putting them into a state of overdrive and leading to cancer. ” (BTW: at least 11 different xenohormones have been identified in the milk of injected cows…). And If that weren’t enough many scientists would tell you that all these environmental toxins are actually making our immune systems less resilient! In plain words, we don’t and/or can’t bounce back as easily and often as we used to….bummer…. not ever going there if I don’t have to….and I won’t have to as long as I am practicing balance in my hormones and thus in my physical, mental and emotional life. Think of it. Before Mr. Boggs took the FDA to court, farmers who were raising healthy, hormone-free cows were not allowed to say so, prohibited in all 50 states from telling us, the health conscious consumer, that their milk was safe ….now, after Ohio, it’s legal in ALL 50 states to let folks know that the milk, cheese, or yoghurts we enjoy are free of the toxins that give us cancer…. 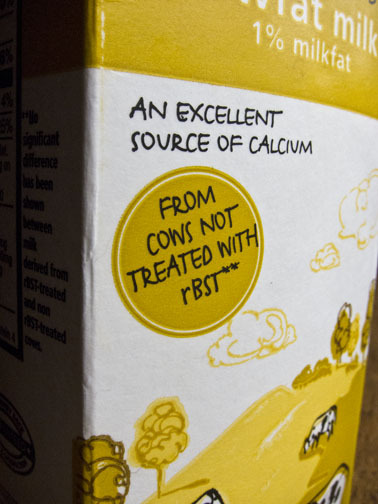 The label to look for may or may not look exactly like the one in the pic below, but basically you want it to read: “RBST-free”, “No r-BST”, “Our cows are raised without synthetic growth hormones or antibiotics,” or words to that effect. And while we’re on the subject, write your congresswoman/man to insist on certified “hormone-free” labeling of food sources raised without synthetic hormones, antibiotics, or var. xeno hormones such as herbicides, pesticides, PCBs, thalates, etc. that are toxic to the body and increase health risks for cancer and other diseases. I never eat any foods that have been shot up with synthetic hormones, THAT I KNOW OF>I sleep with the door open every night of my life, no matter how cold. I take DIM and/or eat a lot of brussells sprouts (see the cruciferous connection last blog in this series)!! Still enjoying the great recipes many of you sent last blog….but have not heard from anyone out there yet who can make cauliflower taste good…and I balance my hormones with bioidenticals based on hormone test results. Thanks Candace for a very enlightening post on the hidden dangers in the foods we often think of as being “healthy” for us. I remember when my son Conor(who is now 27!) was just a toddler and I was wading my way through the maze of providing him with optimal nutrition. Like many young mothers, I tried to limit him from drinking sugary beverages and opted instead for alternatives like apple juice. This was the late 1980’s and organic juices were just not as available as they are now. At the time, I was living in Dallas, TX and thankfully lived close to Bluebonnet Grocery(now known as Whole Foods), so I was able to make better choices. My ah-ha moment came when I read a health magazine that discussed the 7-fold increase in leukemia in children exposed to the pesticides and herbicides in seemingly healthy fruit juices and actual fruits. I was stunned by that article and from that point forward I vowed to choose organics whenever I could. 1. Every year we plant a wonderful array of chemical-free vegetables: butter lettuce, broccoli, string and wax beans, tomatoes, peppers, eggplants, corn and artichokes(my personal favorite!). 2. I primarily shop at local markets(like Whole Foods and New Seasons) and I buy organic dairy, fruits ,vegetables, and meats and whenever possible support our local farmers’ markets. 3. I walk every day with my English lab Riley, often 2-3 times/day. I love the fresh air, some days obviously more than others….but I cannot imagine a day without some exposure to the elements! 4. I too sleep with the window open every night and go bananas if I have to stay in a hotel whose idea of “fresh air” is recycled air conditioning air. 5. I drink at least 4 cups of tea a day: a variety of herbal and green teas. I have a “tea cabinet’ at home and at work. I absolutely love trying new kinds so please share any of your personal favorites with me. Great article!!! Every word is the truth and it’s time that women particularly be made aware of this. Remember when it was natural for girls to menstruate at 15 or 16? Now, it’s not unusual for this to begin at 8. This means the chance of developing a hormone driven cancer has escalated enormously. Although it’s not possible to eliminate every exposure, with eating out etc., I try to keep these xeno hormones to the barest minimum. And I agree with you that supplementing with DIM and trying to keep a large part of our diets filled with cruciferous vegetables, is vital. But of equal importance is living a peaceful, stress-free-as-much-as-possible, lifestyle. Give of yourself to someone who doesn’t know how to ask for it, find something each day to be thankful for, love beyond measure and laugh. Laughter is SO important! Tina you brilliant woman survivor, the issue you raise about girls beginning to menstruate at ages as young as eight and nine is directly connected to the inundation of environmental toxins in our environment and our foods….and it is absolutely the case that the earlier the menses begins, the chance as you say of developing a hormone driven cancer escalates enormously…In fact, the statistical frequency of breast cancer is strictly proportional to the toal lifetime exposure of breast tissue to estrogens – otherwise known as the “estrogen burden”. How we reduce that burden is multifold: avoiding the xenoestrogens not only in milk from cows treated with RBST and all other dairy products: cheese, cottage cheese, yogurts, butter, etc. and/or switching to sheeps or goats milk products, but making sure that the beef, poultry, pork we eat is not pumped up with growth hormones or antibiotics; that we do not heat or microwave our food in plastics but always in ceramic or glass, that we do not drink out of plastic water bottles, but stainless steel, and that the personal care, household cleaners and gardening products we choose are totally free of the nasty parabens, thalates, PCBs, sulfates and a host of hard to pronounce words that are potent threats to our health. I just read an article this morning about the shelf life of cosmetics….that so few have a “sell by” date because they are full of synthetic preservatives that keep them solid for years and that increase our estrogen burden every time we use them…no time like the present to throw them in the bin, and while we’re at it, boycott the bad estrogens that put us at risk not only for breast cancer but for horrible painful periods, endometriosis, fibroids, breast cysts, mood swings, weight gain, and a sluggish thyroid….all darn good reasons to raise awareness and make the switch for the health of it….not to mention feeling and looking GREAT at any age. In 1995, rBGH, or rBST, milk was approved in the U.S. by the FDA, and its use began in 1994. The product is now sold in all 50 states. Monsanto sued Oakhurst Dairy of Maine over their use of a label which pledged to not use artificial growth hormones. I am grateful to you for providing this information and I am incensed! How/why would Monsanto have a case against a dairy farmer who wants those who buy and consume his product to know that it does not contain growth hormones associated with cancer… what’s in it for Monsanto to stop the free flow of information, particularly when it impacts individual and collective health? What can be done, or is already being done for that matter, and where do I sign up? I want to be part of something that exposes this cover-up of information so vital to our health…if anyone out there can add more to this, please respond…. what actions can we take? You mentioned not having found a recipe to make cauliflower taste good. My husband makes a tasty dish we call Cauli Mac N Cheese. It’s loosely based on an Atkins recipe. 1. Cook pasta according to directions. Drain and rinse. Transfer to large bowl. 2. Cook cauliflower in lightly salted boiling water until tender, about 5 minutes. Drain and rinse. Add to pasta. 3. In large saucepan, whisk together cream, water, sour cream. Cook over medium heat for 5 minutes, stiring occasionally, until mixture simmers and thickens. Stir in cheese, salt, pepper, and cayenne pepper. 4. Fold in pasta and cauliflower. Cook, stirring gently, until heated through. Thank you!! Sounds hmmmmmmGOOD…..Can’t wait to try your recipe – tonight is the night…I’ll let you know how it goes down…stay tuned! I am thankful for this blog, Candace and Kyle, as it truly helps us all become more conscientious about the things we are consuming. Is it true that xenohormones have been banned in Europe and Australia for decades? I remember reading that somewhere. And yet, why do they continue to be used here in the US? I also remember reading about how big pharma is currently researching new drugs to help delay the onset of girls having their menstrual periods, as some had begun menses at age 8- just as Tina mentions above. Well, one day, I was commenting to a checker at Costco how terrific it was that Costco was carrying so many more healthier alternatives, including hormone-free milk. And she responded that her doctor suggested that she should also buy hormone-free milk as her daughter started her period at age 6! You are so right about the xenohormones and other harmful toxins in our personal care products too- skincare, cosmetics, but let’s not forget ANY products that contain animal by-products! Protein shakes, supplements, etc? Do we really know how these animals are being processed? Were they full of hormones? Were they sick and injected with antibiotics? All the more reason to partner with companies that adhere to pure, safe, and beneficial principles. Which is why I shop at New Seasons and Whole Foods- like Kyle, and why I chose to partner with Arbonne 20 years ago for all my personal care, protein shakes, and nutritional supplements. BTW, I also love brussell sprouts, exercise everyday, take bio-identical progesterone cream, probiotics, and have been using DIM for over a year now. I also eat gluten-free and avoid GMO wheat, soy and corn, and I eat these things in moderation- dairy, alcohol, caffeine, and sugar. Cauliflower: mostly the south beach way: steam til fairly soft, don’t overly drain (use its own rich moisture to blend; pop into a Cuisinart with one tablespoon of sour cream, salt, pepper and the scallion tops off of a small bundle of green onions. Serve with salmon and s few Julianne strips of tricolored peppers over the top. Beautiful and tasty. Two of us eat a whole cauliflower this way in one setting. DIM, fiber, low cal, Yummy – what is not to like!?!! Did you know there’s no test on the market that can tell the difference between milk from cows treated with r-BST vs not treated? 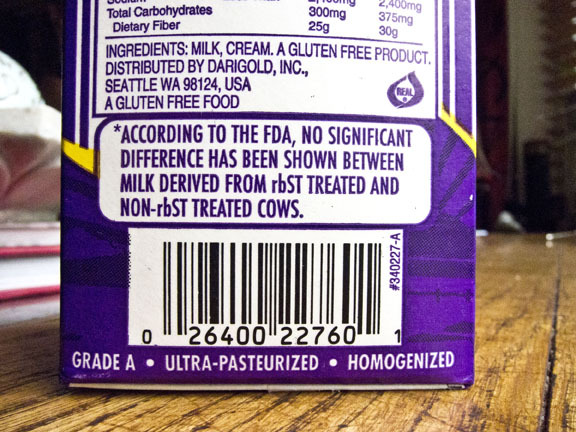 If you see a label that says “rbst free” or whatnot, it has not been tested in any way, it just means that the producers have signed a piece of paper saying they don’t do it. As for some of the other comments here, please stop perpetuating the myths about “pumping animals full of hormones.” It is quite illegal to use growth hormones in the poultry and swine industry. Some hormones are allowed in beef but at levels so negligible that the end product makes no difference. To give you an example: Take 500g of beef (about 1 pound) – there is about 7 nanograms (nanograms = 0.000000001 gram) of estrogen present if the animal has been implanted. For non implanted steers, it’s about 5 nanograms. Because these numbers are small and sometimes hard to conceptualize, divide a paperclip (which usually weigh 1 gram) into 1 billion pieces. One of those billion pieces is a nanogram. So two of those billion pieces of a paperclip equals the difference in estrogen present in one pound of beef from animals implanted vs not implanted. I’m sorry for the long comment, but I just like to put some issues in perspective. I see a lot of misinformation and general fear of hormones and substances that enter the body from people that they don’t need to fear unless for some reason they have an actual health condition that would be worsened by consuming certain foods. Take this comment as you want. I know everyone on the internet is an “expert” so I’m not going to pretend to impress you, but I spent my college career in animal sciences and have taken enough biology/chemistry/organic chemistry/biochemistry/nutrition/anatomy/genetics to have a handle on some things. r-BST works by extending peak lactation past its usual window. It can and does have a tendency to increase SCC (somatic cell count) but assuming the farmer is practicing good management, this isn’t an issue…especially since all milk on your shelf has been pasteurized anyway. SCC over a certain amount are rejected and don’t enter the milk supply – just as any trace of antibiotics found means the entire milk truck is dumped (and the farmer responsible not only loses a paycheck but is also fined – and it’s a “one strike” rule. Trace antibiotics back to you once, a fine, twice, you can’t sell your milk anymore, government shuts you down). There’s no incentive to pumping animals full of antibiotics, despite what Food Inc and others like to claim. Thank you very much for shedding light on this all important subject. You are obviously educated, trained and well-informed on the subject, and I take your point. But whatever hormones are injected into our foodstuffs in the however negligible amounts you refer to, these are still potent hormone disruptors in humans. (The Endocrine Society is a very reliable source on that frightening reality.) What interests me more than the breakdown of levels in an ounce of hamburger, is their breakdown at the cellular level in the human body. No we can’t precisely determine those amounts yet, but as far as I am concerned, if I have a choice, and I do, I would rather exercise it in favor of that which is whole, natural, and unadulterated by synthetic anything. If as you say there is no precision testing or reporting of these levels, I will continue to purchase my foods from local organic farms, farmers markets and health food stores I trust and have taken pains to check out so that I am assured I am getting the best of the lot. Until the USDA and the FDA and whatever other governmental body takes the lead of European countries that have for decades banned all artificial and growth hormones in foods, I’ll keep on warning against the hazards to our health of eating foods containing growth hormones that accumulate and store in our bodies. This is not about defending the honor of the RBST insudstry, this is about human health. The film Food Inc. may not fit into your science but it did clearly show us how many chickens the Tyson food barons can cram into a cage…no thanks, I’ll take mine free range and happy.